Globally, waste has become a serious issue causing environmental pollution, degradation and taking up valuable land space. Many human activities have not considered the impacts of our relentless production, distribution and consumption of man-made products. Neither has there been much consideration of how these products and their components could break-down over time using the earth’s continuous natural processes. Per capita waste generation rates in many developing countries have now crossed the one kilogram per day mark (UNEP, 2013). There are several documentaries on the topic that are worth checking out including ‘Trashed’ (2012). Another film project is Plastic Oceans. Waste management is an issue for organisations seeking to become greener and save on disposal or recycling costs. Corporate Social Responsibility practice has come a long way over the years in raising the profile of this issue and businesses are under increasing pressure to reduce their impact in relation to waste management, product safety and the life cycle analysis of products from cradle to grave. 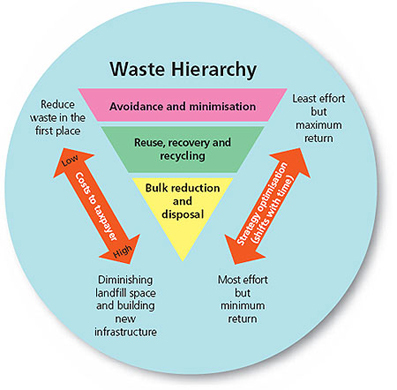 This diagram from Wastereduction.gov.hk outlines some of the key concepts in the waste hierarchy and its management. Food waste is an interesting problem because, when disposed of in landfill, organic waste produces methane gas which is a greenhouse gas. Methane is around 23 times more powerful than carbon dioxide. James Cook University in Queensland has adopted industrial scale bokashi-style systems to turn food waste into an income stream – a bio-regen system. From the United Nations University, comes this 5 minute video about how a Japanese company is turning plastic waste into different kinds of oil for reuse. Planet Ark has put together this information resource about recycling and waste minimisation for businesses. Responsibility for waste and recycling is shared across all three levels of government in Australia. In recent years, the Australian Government has put in place various strategies to reduce the amount of waste and to deal better with recycling products such as e-waste. Read more about policy development and historical facts in this publication by the Australian Government, ‘Waste and Recycling in Australia 2011’ (there are also editions available for previous years). The Gold Coast City Council has a GreenGC website with links to many free posters, signs and industry guides in the interest of encouraging everyone to play a role in waste reduction. The Queensland Department of Environment and Heritage Protection has a series of resources on a wide range of waste topics here. Over a thousand standards exist in relation to waste management and these can be searched on the SAI Global website here. The United Nations Global Partnership on Waste Management (GPWM) is an open-ended partnership for international organizations, governments, businesses, academia, local authorities and NGOs. It was launched in November 2010 to enhance international cooperation among stakeholders, identify and fill information gaps, share information and strengthen awareness, political will, and capacity to promote resource conservation and resource efficiency. Another key international development is The Basel Convention on the Control of Transboundary Movements of Hazardous Wastes and their Disposal which was adopted on 22 March 1989 in Basel, Switzerland, in response to a public outcry following the discovery, in the 1980s, in Africa and other parts of the developing world of deposits of toxic wastes imported from abroad. Other international developments have helped to escalate such issues up the political agenda including the Rotterdam Convention on the Prior Informed Consent Procedure for Certain Hazardous Chemicals and Pesticides in International Trade, and the Stockholm Convention on Persistent Organic Pollutants. A sample of one of the national waste and recycling events can be found here. Recycling Near You – This national not-for-profit initiative established by Planet Ark can help you to find recycling services near you.